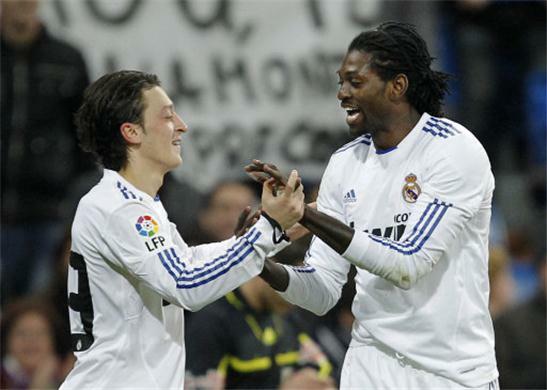 Emmanuel Adebayor is still hoping that the Spanish giants Real Madrid call him up and sign him in a permanent deal. The Togolese striker already expressed his desires on joining the Spanish team and wishing Manchester City will allow him to leave but everything is far from done. The 27 years old striker signed a loan deal with Jose Mourinho’s team last season and scoring 5 goals in 14 appearances. Now everything lays upon the Portuguese coach on whether or not he wants Adebayor to enter the squad although it seems improbable. It seems rather improbable because Real Madrid has been in the search of another striker on the transfer market for some weeks now and not even counting that they already have: Karin Benzema and Gonzalo Higuain both ready to make their presence known in the next season. And in the transfer market they already have their eyes set out on Sergio Aguero of Atletico Madrid who seems to be almost ready to join Jose Mourinho’s squad. But according to the striker himself, he has re assured everyone that he has already spoken to Mourinho before the season ended and the vacation started. ”We [Adebayor and Mourinho] talked before we went on vacation,” Adebayor told Spanish publication Marca. Not only Sergio Agüero has been linked with a possible move to Real Madrid but also Neymar of Santos and even Carlos Tevez which puts Adebayor’s wishes in a further complicated manner. But who knows what the future holds for Adebayor if he somehow manages to join Real Madrid and play alongside some of the greatest soccer players today including: Cristiano Ronaldo, Mesut Ozil, Iker Casillas and company. Although Manchester City will now allow him to leave unless they receive a good offer for the Togolese striker. The offer should be around €25million taking into consideration that was the price they bought him some years ago from Arsenal.